Bumper repair is a very sensitive matter when it comes to your vehicle. Apart from being sensitive, it is also cost effective. 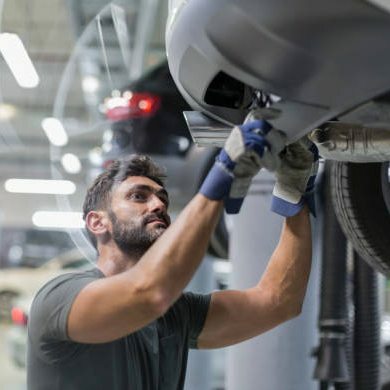 There are umpteen reasons to have your vehicle’s bumper repaired; here we’ll focus on a few best reasons for getting the bumper back in shape. At some point in time, you surely will want to look at buying either a new vehicle or might want to exchange the vehicle. When you talk about buying a used motor, there are few things that you will first look for, like, a good engine, good tyres, good body that is free of dents and other scratches. Bumper damage adds to the list, and if you don’t take care of the bumper, it surely will bring the value of your vehicle to half. It is in your best interest to have your vehicle in a good selling condition. A good trade comes with multiple factors that are in place in the vehicle. With a small investment and a good auto repair provider you can get the bumper repaired and make your vehicle look better and in good condition. Care must be taken when you select location to do the repair. You must ensure a warm, dry place with adequate ventilation is where your vehicle is worked on. Ensure the insurance is in place. Make sure professional service providers handle the repair, and you don’t try doing it yourself. Bumper repair comes at a cheaper price than you can think of. There is a belief that, it is better to replace a bumper than repair it. A new bumper can cost you a fortune depending on your vehicle. There is a auto servicing companies where you can get the bumper repaired at a reasonable cost. There are options like plastic bumpers that you look at as well. Plastic bumper replacement will also save you a lot of cost and time specially. Bumpers come in different types of plastic materials. You will have to make sure you are aware of the material your vehicle is made up of. Different type of plastic has different sanding and workability characteristics. It is important that you be able to identify your bumper type before working on it. On the whole a great vehicle needs a lot of care from the user end. It is always advised to visit professional care services for your vehicle. Vehicles operate like human bodies as we need a right doctor so do the vehicles need a right professional.